Caesar, aka Andy Serkis, aka Gollum does yet another great job behind the motion-cap suit as the leader of the apes in Dawn of the Planet of the Apes. I’ll tell you right off the bat: this sequel is worthy of watching twice! The first installment, Rise of the Planet of the Apes, left off with the virus spreading across the world and Caesar escaping into the woods with his fellow apes. Dawn begins nearly a decade later. Most of the human race has died off, but those immune to the virus have begun to restore power. A few humans go into ape territory and Caesar allows the refugees to regain electricity to the city. But another ape from the first movie still hates humankind and starts the war Caesar hoped to avoid. In the end, it’s a clash of human vs. ape and also ape vs. ape. The whole movie I rooted for the apes. Yes, I did feel bad for the humans and the suffering they had to go through from the virus, but I was so set on watching Andy Serkis play Caesar that my pity for the humans was stolen away. I was captivated watching him raise a family in the woods, build hundreds of followers and learn that not all humans are evil and not all apes can be trusted. 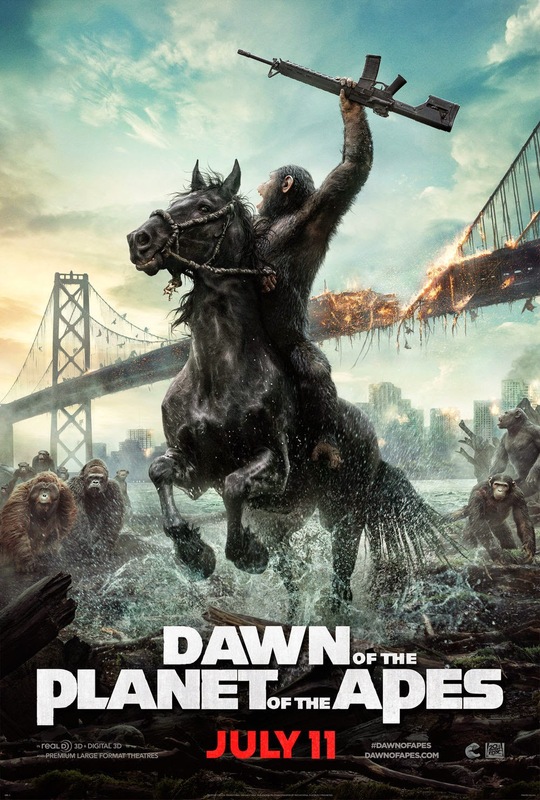 I highly recommend seeing Dawn of the Planet of the Apes on the big screen for its great story, plot and characters. Plus, what more could you want than talking apes riding horses and shooting guns?